My love affair with Tarmogoyf began while I wasn’t playing Magic at all. But “you never really quit,” and as winter ebbed in 2009, I found myself pouring over Legacy decklists to see how the game had changed since I’d begun my hiatus triggered by Kamigawa block (specifically Umezawa’s Jitte) leaving Standard. Anyone who played a constructed format around this time can tell you in a heartbeat what I found. Legions of Merfolk, Zoo, and even CounterTop decklists with one thing in common: a playset of Tarmogoyf. I was spellbound. What was this weird-looking creature doing in tribal aggro decks? In dedicated control decks? In combo? Why were people playing it with Tarfire? What was Tarmogoyf, even? Never mind the hours I spent trying to decipher Justin Murray’s famously despised, now-iconic Future Sight artwork. Tarmogoyf had me hooked. Today, he’s still got homes in a few Legacy decks, but he’s all but extinct in Vintage and almost certainly never returning to Standard. Thankfully for his fans, he’ll always have a place in our hearts and decklists in Modern. Tarmogoyf represents the peak of power/toughness efficiency. I love cards that excel at their jobs. Take the most powerful burn spell of all time, Lightning Bolt. Despite the card’s simplicity, its flexibility is unrivaled. My favorite creatures follow Bolt’s example, attacking and blocking very well and doing almost nothing else; I’ll play Delver of Secrets, Wild Nacatl, and Hooting Mandrills over wordy staples like Snapcaster Mage and Tasigur, the Golden Fang any day. Just as Lightning Bolt can kill a creature or help bring opponents to zero life, Tarmogoyf can swing like a ton of bricks or wall opposing aggression. This versatility makes him a mainstay in decks with multiple gameplans, like Delver and BGx, and a serious consideration for anyone who wants to win some games by attacking in Modern. In Magic, an “ability” as simple as “this creature is way bigger than it should be” adds countless dimensions to games, and to deckbuilding in general. None of Modern’s removal performs as well as Lightning Bolt given the format’s speed, and Goyf is its only reasonable attacker who survives the instant for just two mana. That means he outclasses all other creatures at his mana cost, itself located halfway to four, the crucial turn in Modern; Goyf then has enough time to pressure opponents and leave his master with open mana to answer game-winning plays. All these elements combine to provide the perfect Stomping Ground for Tarmogoyf, while pulling the format’s “goodstuff” archetypes like tempo and midrange into green. I couldn’t believe my eyes. Tarmogoyf, Tarfire, and Blood Moon together. Here was the deck I’d always wanted! While my experiments mashing Aether Vial, Grisly Salvage, and Bitterblossom together yielded 8/9 Goyfs a good chunk of the time, nagging memories of Lightning Bolt‘s insane power always made me homesick enough to bench the project. But while I sacrificed the 8/9 dream for “Draw 3 Wild Nacatls,” Igarashi Ryuuta had been living it on the other side of the world. Far from crushing my spirit, Treasure Cruise‘s banning gave me an opportunity to again focus on the Tarmogoyf/Blood Moon deck. I had a real reason not to despair, unlike the dirgeful Pod players at Face to Face. To their chagrin, my last 4-0 with Treasure Cruise played out like a celebratory Día de los Muertos. Then I went home and started brewing, with Abzan looming menacingly over Modern. Having established my crush on Tarmogoyf, I’d be remiss not to mention my infatuation with Blood Moon. As I bit into Modern, I spent some time working on Skred Red, eventually splashing green for Lhurgoyfs. 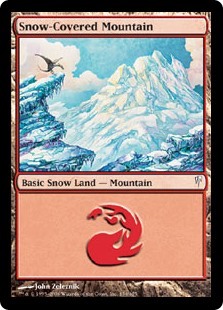 Even with Spirit Guides, I couldn’t turn-two Blood Moon consistently enough for me, especially since opponents fetched basic lands at the mere sight of a Snow-Covered Mountain. Ryuuta’s list ran the Goyfs now required to keep my attention, the Tarfires I so badly wanted to sleeve up in Modern, and enough acceleration to take full advantage of the gamebreaking Blood Moon. Since no one played Chalice of the Void to prevent us from playing one-drops, and we’re in green anyway, I don’t understand Ryuuta’s choice to play Rituals over mana birds. Rituals have some benefits, such as “surprising” opponents with a burst of mana and not getting chewed up by Lightning Bolt, but they only put us ahead a mana for one turn. Birds of Paradise, on the other hand, pushes us ahead for the whole game, allowing us to follow Blood Moon with higher-curve haymakers like Huntmaster of the Fells. Additionally, it seemed to me like attracting Bolts wasn’t a horrible place for Birds to be, considering the low toughness of Goblin Rabblemaster and Magus of the Moon. In the following builds, I scraped the rituals (and eventually the Sprit Guides) for mana dorks. An early Blood Moon can prove impossible for game one opponents to overcome and the time it buys us is best utilized beating them up with efficient threats. Modern’s most efficient threat is Tarmogoyf, a card so far off the format’s relative power level it’s become infamous as a $200 staple that fits into just about everything. TURBOGOYF’s strategy resembles that of Legacy Stompy lists, which use Sol lands, Spirit Guides, and Moxen to power out powerful lock pieces like Blood Moon, Trinisphere, and Chalice of the Void. Stompy decks follow these effects with resilient beaters to close out the game before opponents can respond meaningfully. Players expect the three-mana enchantment in game two from decks with stable-looking manabases, but they still lose to it. In game one, and especially on the second turn, it’s nigh unbeatable for many decks, especially when supplemented with fast pressure. Modern manabases are incredibly greedy, and even two-color decks frequently play manabases comprised almost entirely of nonbasics (GW Hatebears, BW Tokens, UW Control) or that rely heavily on nonbasics to function optimally (UB Mill, UR Twin, Gx Company). In January 2015, I wrote up this list of the known Modern archetypes, and Moon’s relevance against each. I sorted the decks into 4 categories: ones that auto-lost to Blood Moon, ones that lost to Blood Moon almost every time it resolved, ones that could still win through Blood Moon, and ones that ignored the Moon entirely. Asterisks denote “big” decks. Modern has changed significantly since January 2015, but many of the big decks listed above still exist in some iteration. Because it hoses so many decks, I consider Blood Moon the format’s strongest disruption spell, besting both targeted discard and countermagic. The former is cheap and does something against every deck, but loses relevance in the late-game and fails to answer topdecks. The latter spends an opponent’s mana as well as his card, but must be used in a very specific window: while that card is on the stack. Blood Moon comes down early enough in this deck to make a lasting impact on the game, and its disruption translates to every card in an opponent’s deck while hardly touching our own. Against decks with very few basic lands, even a turn 10 Blood Moon can steal the game. In games two and three, Stone Rain effects eliminate the basics opponents now know to fetch out early. Every deck changes during development, but each version of TURBOGOYF shares a highly synergistic core of components that enable its strategy. Blood Moon is at its best when cast before opponents fetch their basics, so it needs to hit the battlefield either before they expect it, or before they have time to react. We need to build around these conditions to maximize their odds of occurring. We should play lots of Moons. Magus of the Moon is worse than the enchantment, since opponents can Bolt him (and they’ll have no shortage of Red mana), but he does apply pressure on his own. We should max out on dorks. Eight mana birds, a set of each of our finest options, help ensure the Moons we draw come down on turn two for maximum impact. Birds of Paradise helps cast off-color spells or color-hungry ones like Molten Rain and Thrun, the Last Troll. Utopia Sprawl makes the color we need it to depending on openers and can’t be Bolted, making for extra-reliable ramp. Of course, running eight Birds and 6-8 Moons means a lot of dead draws and redundant pieces. We need a way to turn these superfluous pieces into actual business. Faithless Looting does just that. It also has the benefit of cycling extra lands – since the deck curves out at four mana, cards that provide mana in excess of four filter into additional threats or disruption. Once Blood Moon resolves, its controller must back it up with beats to seal the game before his opponent draws out of the lock. Tarmogoyf and Huntmaster of the Fells are our strongest aggressive options, proving both resilient and threatening beyond anything else at their respective mana costs. Tarmogoyf survives Bolts and comes down blisteringly fast at just 2 mana. He quickly grows to 5/6 in this deck, allowing him to trump every relevant body in the format this side of Primeval Titan. If opponents do succeed in Bolting our Birds, Tarmogoyf makes for the best walking funeral procession we could ever ask for. Birds and Magus already take some heat off Huntmaster of the Fells by competing for Bolts, and the Human Werewolf provides an ungodly amount of board presence if untouched. He curves us out perfectly – 4 mana lets us cast Birds into Moon into Huntmaster. Flipping him over multiple times provides card advantage without costing cards, and doing so proves laughably easy with so many mana birds and Looting. Against a locked-down opponent, he deals 8 damage the turn after we cast him, 6 the turn after, and 10 the next, rivaling even Geist of Saint Traft in terms of pure damage-for-cost. And while Goyf survives Bolt and even Roast, Huntmaster gets around Edict effects, most importantly Liliana of the Veil‘s. Huntmaster and Goyf also happen to destroy decks unfazed by Blood Moon (Mono Green Stompy, UR Delver). These are primarily one- or two-color aggro and midrange decks of the budget variety. This first draft of TURBOGOYF was built on the premise that an 8/9 Tarmogoyf ends games faster than anything else. I started with 3 Huntmaster of the Fells and diversified my threats with Chandra, Pyromaster, who took a lot of heat off the pilot by demanding answers against aggro decks while drawing cards against Control decks (pumping Tarmogoyf from the Graveyard to boot). I liked that she provided a soft-lock against decks like Affinity and Infect, eating away at their creatures and giving me ample time to overwhelm the board with pressure. Growing the perfect Goyf requires us to run a diversified answer suite, explaining Tarfire and Pyrite Spellbomb. Tarfire can “counter” Lightning Bolts aimed at an innocuous Goyf by surprise-growing him at instant speed, while Spellbomb deals with annoying permanents like Kor Firewalker, Master of Waves, and Etched Champion or cycles against decks immune to removal. Since no Modern decks play tribal cards (outside of the odd Bitterblossom), Tarfire always gives our Lhurgoyfs an extra boost. Unlike Ryuuta, I didn’t want to give up the versatility of Lightning Bolt, so I maxed out there first and omitted Seal of Fire entirely. This build ran two Rains in the main, and two in the side. Now, all four land destruction spells reside in the sideboard. Blood Moon catches opponents off guard enough in game one that we don’t need Molten Rain in the mainboard. They come in for game two almost universally, as opponents know by then to fetch their basic lands. Our Moons still come down on the second turn, meaning Rain can hit whatever basic land opponents have searched up to lock them out. Since it mostly hits basic lands, and because of its double red cost, Molten Rain eventually becomes Stone Rain in these decks. 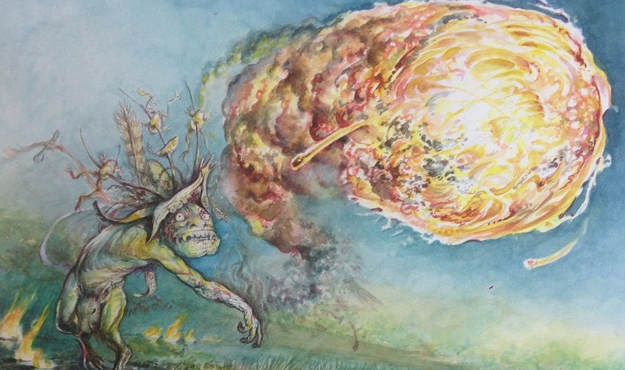 But color-light versions of TURBOGOYF like this one prefer Molten Rain for its ability to Shock a planeswalker. The fourth Huntmaster is better than the third Chandra. Sword of Light and Shadow is better in the main than in the side, where the entire set of Molten Rain belongs. Simian Spirit Guide is the worst card in the deck; I often boarded him out for “real things” in games two and three, and would frequently cast him to pressure a Control opponent or to bait a counterspell, in which case a “real thing” would have performed better anyway. This was just my first stab at the deck, which changed greatly over the following few months. Next week, we’ll take a look at the deck’s continued evolution, including implementations of Stone Rain, Siege Rhino, and Chalice of the Void. There was a list along these lines posted on SCG a few weeks back that included twin+exarch and a buttload of swords instead of goyf/huntmaster. Same premise though of powering out bloodmoon via mana dork – it just tried to use lootings to put together a twin combo and suited dorks up with swords to make them relevant. Tried that build, but it was so bad against URx decks it wasn’t funny. Bolts, forked bolts, and electrolyzes make mincemeat of mana dorks trying to wear swords, and they would fetch basic island and then laugh off the blood moon. Goyf+huntmaster seem like a better plan after t2 moon, and I do like utopia sprawl+looting asa way to feed the goyf and have unboltable t2 moons! I’ve tried Twin with dorks as well, but also found that deck really wanted Goyfs. Can you share a link to the list? Correct! As you’ll see next week, I come to rely on Abrupt Decay to solve this issue. Minor nitpick but Abzan Midrange fairs better against Moon than Abzan Company. Midrange usually having 4 basics, same number of fetches, and ten ways to stop it. Company running 1 less basic and usually having 0-1 ways to stop Moon is pretty serious. At the time I played this deck, almost everybody was on Abzan Midrange, which had something like a 12.5% metagame share. The matchup was practically a bye. Company decks were pretty new, and optimal lists (or even ones that won big tournaments) had yet to be developed. Company decks are running seven mana dorks and most of them that I’ve seen do actually have multiple forests. They also run cards like Qasali Pridgemage and Reclamation Sage (+ ways to tutor them). Blood Moon is pretty bad against them. Way too high variance. Well, reading about card you probably never play in real life is a bit awkward. For the deck itself, I somewhy think Gitaxian Probe could be an option if you want to thin deck as much as possible and scroll through it just for some stray two life. That’s not what this deck wants to be doing. dont like the deck. looks awful. sorry. Nice article. Makes me wish i had goyfs.